Share your patriotic moments of celebration with us! Take a snapshot of you and your family celebrating the nation’s 49th Birthday. 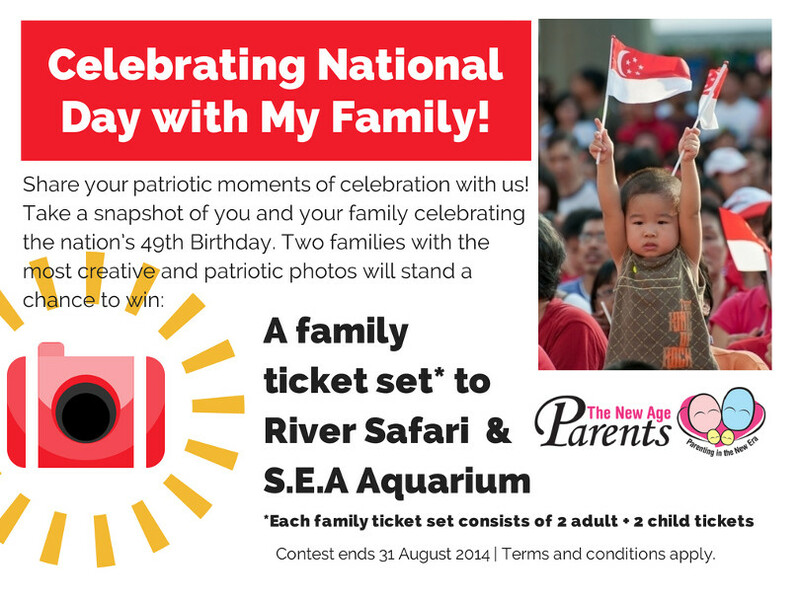 The two families with the most creative and patriotic photo stand a chance to win: 4 tickets (2 adult + 2 child) to River Safari + S.E.A Aquarium! Do you love Singapore? We do! Here are 49 Reasons Why We love Singapore. 3. Like, Share & Comment this Facebook post. Do look out for other contests on The New Age Parents contest page to win more attractive prizes! How well do you know Singapore? Here are 49 Interesting Facts About Singapore we bet you didn’t know! Contest ends 31 Aug 2014. *Winners will be contacted via phone and email. * Winners to self collect from New Age Consulting office. * Prize collection period is from 1 to 30 September 2014.